At last year’s Byron Writers Festival, standing at the back of the Yellow Brick Road Pavilion sipping on a couple of cold local brews, a friend remarked that festivals like this, to her mind, were actually more readers festivals than writers festivals. I’ve been thinking about this idea since, and it came back to me at this year’s event – while everyone up on a stage, moderators and panellists, are all writers of various stripes (poets, novelists, journalists, songwriters), the vast majority of people attending the festival are readers. Sure, there are writers in the audience – journalists like myself, other writers who enjoy hearing their peers speak, no doubt a huge contingent of hobby writers – but in the main, what unites everyone at a festival like Byron’s is the fact we’re all readers, from the most famous person on the bill, to the young kids running around with their parents. We’re here because we love to read, and while it’s a writers festival, it’s more, on a base level, a celebration of reading. And this is a wonderful thing to be sure. It’s become a fact of life for me (and I’ve yet to determine whether or not it’s a good or not so good fact) that I now enjoy writers festivals as much, if not more so, than music festivals. One reason for this is as I’ve gotten older and more intolerant of other people (grumpy writer, indeed), a writers festival seems more a haven as opposed to a happening. There’s a sense of calm (particularly at a festival like this one) that pervades, far more so than at, say, Splendour In The Grass, where it’s pell-mell for three days, no quarter asked and none given, my head and liver are aching, etc, etc. And there is indeed a time and a place for that, please don’t get me wrong, I’m not that old and jaded. But walking around in the mid-winter sun on the Saturday afternoon of the Byron Writers Festival, a newspaper sticking out of my back pocket and a hot cup of coffee in one hand as I casually navigate my way to whatever it is I’m keen to see next, has become one of life’s real pleasures. This year, whatever it is I’m keen to see is similar to previous years – what I want is journalists talking about journalism, experts talking about politics, and musicians talking about music and songwriting. And, as has always been the case, I am offered a plethora of all three. Over the course of the weekend, I attend panels like More Than A Good Story: Excellence In Journalism, chaired by The Saturday Paper’s Karen Middleton, talking to the likes of Louise Milligan (Four Corners and author of the recently released Cardinal: The Rise & Fall Of George Pell), Kate Wild (a freelance broadcast journo and author of Waiting For Elijah) and Trent Dalton (a staff writer for The Weekend Australian Magazine and author of the very highly acclaimed Boy Swallows Universe). They talk all things journalism pertaining to their books, for the most part; due to an ongoing legal issue however, there’s little I can say about this panel aside from the fact it was very informative and interesting. Also, on the Sunday afternoon, I sat in and listened to Brisbane journalist Matthew Condon probe deep with a panel of investigative journos for No Stone Unturned: Investigative Reporting. The panel, comprising Kate Wild again, ABC journo Allan Clarke and Norwegian investigative reporters Eskil Engdal and Kjetil Saeter, offered a fascinating insight into how these journalists work on these huge projects, many of them running over not just months, but years. Journalism is in a tricky state in Australia in 2018, but money being put toward investigations like these (tracking down pirates on the high seas; investigating police shooting deaths of indigenous or mentally ill young men) is imperative – it warms the heart to know there are people out there prepared to dig and dig and dig in order to bring forth these stories, all of which are so important to the national, and indeed international, conversation. And of course, music. There wasn’t a great deal of music-related content at this year’s event, but this is neither here nor there – what was on offer was good, solid fare, some great conversation, laughs, insight into how people go about writing songs, those little things that carry so much weight and power. On the Saturday afternoon I sat and listened to ex-Fairfax music writer Bernard Zuel, talk with old friend Tim Rogers. I’ve interviewed Tim a number of times over the years myself, and he’s one of those people who, after being asked a single question, will happily wax lyrical for hours. He’s articulate, forthright, self-deprecating but not to the point where it grates, always angling for an opening in which to insert a quip, an off-the-cuff remark that’ll break down any barrier you may have perceived to have been between you and the ‘rock star’. Zuel, of course, is one of the best in the business. His exquisite line of questioning opens Rogers up further as the two of them cover ground from Tim’s early years working in a pizza shop in Sydney’s west, his mental health, his drug use, and of course his movements through music over the past three decades. Rogers is, as he says, an enthusiast these days – not a musician, an actor, a writer (his book, Detours, was released in August last year), but an enthusiast. He’s always been enthusiastic, but now he seems to own it, and perhaps for the first time ever, Tim Rogers seems genuinely happy being Tim Rogers. He pops up again on the Sunday arvo as part of the Song Writing panel with another old friend of his, Bernard Fanning. The session is chaired by local comic Mandy Nolan, who takes an eternity introducing the pair (who really need no introduction), and indeed, it seems the panel is far more about her than the two sitting to her left, but she soon settles in and while the conversation that ensues doesn’t really touch that much on the writing of songs, it’s interesting and entertaining, to say the least, a fine way to end what has been an entirely pleasurable weekend. And so it ends then, for another year. 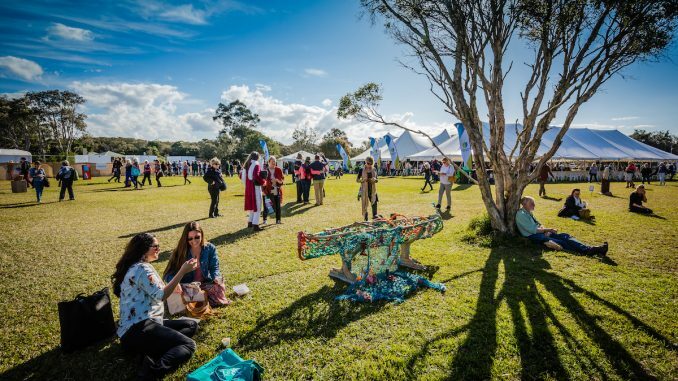 Whether a readers or writers festival, the Byron Bay Writers Festival is one of the best, a showcase of some of the world’s finest writers, in idyllic surrounds, a true celebration of not just writing, but reading too, which is just how it should be.